Breathalyzers are one of the few devices that are both lots of fun and totally practical, and BACtrack makes some of the best. Right now, Deadspin readers can save 20% on the BACtrack Vio smartphone breathalyzer - just $39.99 + free shipping. 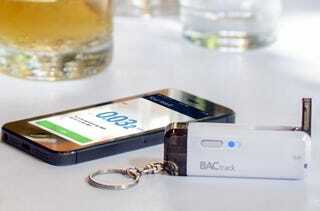 The BACtrack Vio Smartphone Breathalyzer is the smallest and simplest way to turn nearly any smartphone into a high-performance alcohol screening device. Simply open the flip-up mouthpiece, blow for 5 seconds and voila, you have an ultra-accurate BAC reading right on your smartphone. You can also estimate how long it will take to sober up, and play the fun “guess your BAC” feature with friends. The BACtrack Vio comes with a one-year warranty in case of defects, plus 3 mouthpieces and a AAA battery to get you started. It normally runs for $50, but Deadspin readers can grab one today for 20% off + free 1-2 week shipping to the US and Canada. Hit the link below and get yours today.